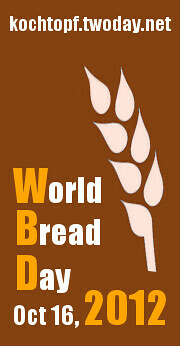 Bread blog from Hong Kong. 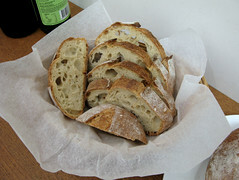 From Bo Lo Bao to Sourdough. 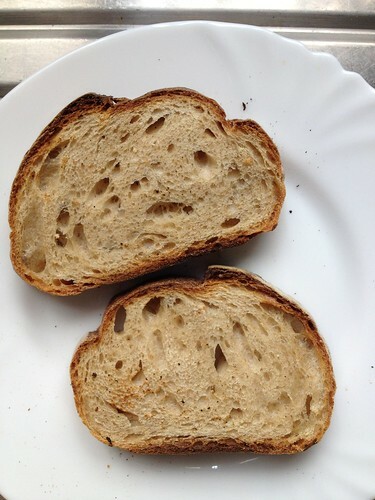 The Pain au Levain with Whole Wheat Flour is from Jeffrey Hamelman’s recipe. 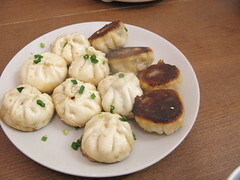 I retarded it overnight and the taste was really good, sweet and strong in wheat flavor. I also experimented by substituting 5% of the whole wheat flour with amaranth flour. 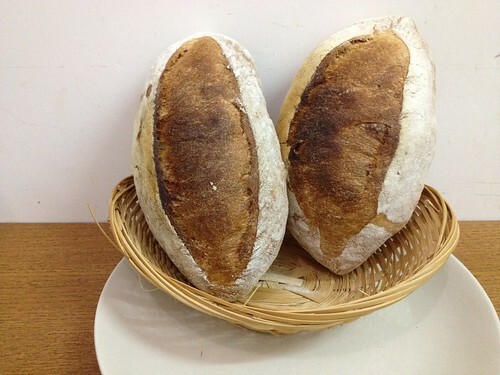 It was prepared in the same condition – same retardation, fermentation hours, both bread baked together. 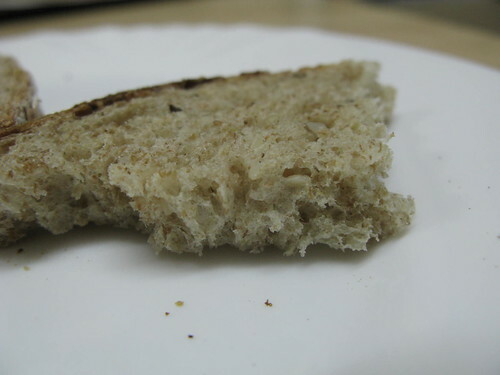 Interesting finding was the whole wheat and amaranth bread was a bit gummy in texture (crumb & crust), also the taste was not as sweet as with whole wheat flour alone. Gosh seems whole wheat and amaranth cannot be a couple now? Maybe give them some time and let me try to experiment more first.. This is my first contribution to Mellow Bakers. I like this forum where people can share their bread baking results by following recipes from the book “Bread” by Jeffrey Hamelman. 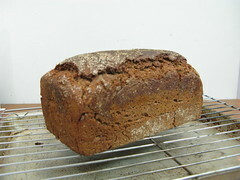 In this rustic bread, there is 10% rye, 10% wholemeal and 80% bread flour (I used King Arthur All Purpose). Hydration is 69% and the dough was pretty slack. 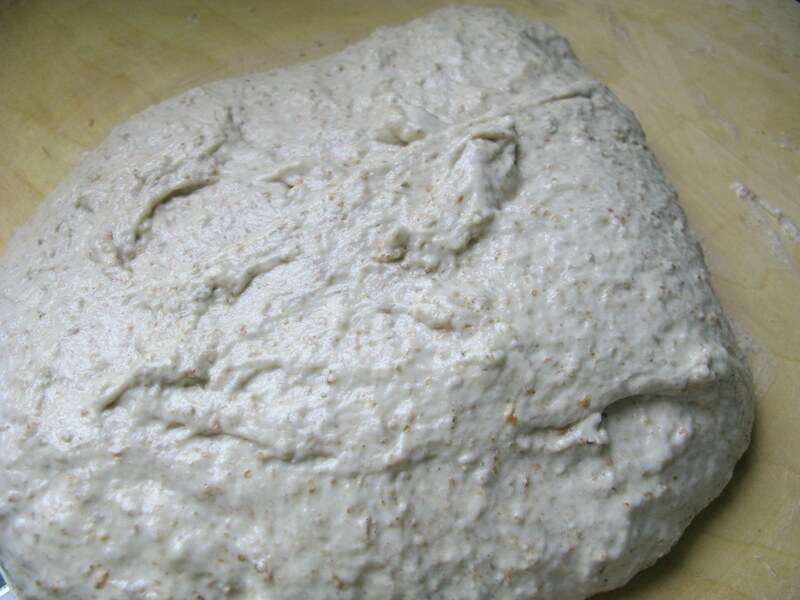 I stopped kneading when it had medium gluten development and gave it 2 folds during the first fermentation instead. 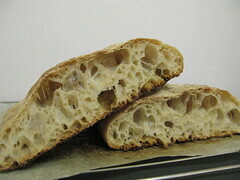 However the dough was still too slack to make a shape except making it into a ciabatta. It spreaded out as well when removing from the couch to the baking tray. As a result the bread was resulted quite flat. I think I should use stronger flour next time! The bread was baked at 450F for 38mins. 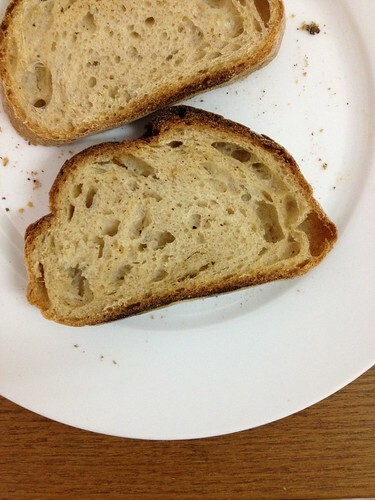 Its taste was good with a complex flavor in the crumb and crust. Love it, except my skills in managing the dough strength is yet to be improved! I’ve always thought King Arthur’s All Purpose Flour can be used for bread as there was a baguette recipe on the back of its flour bag. Until a month ago I received an email reply from King Arthur as I asked them about the flour, I realized I should really use bread flour suggested in Jeffrey Hamelman’s book instead of AP, as AP is a soft flour. Now I know why my rustic bread turned flat!! 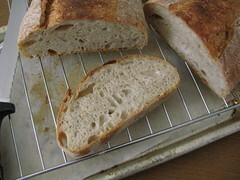 This recipe is from Jeffrey Hamelman’s “Bread”, a sourdough made of flour, salt and water only, and no commercial yeast. 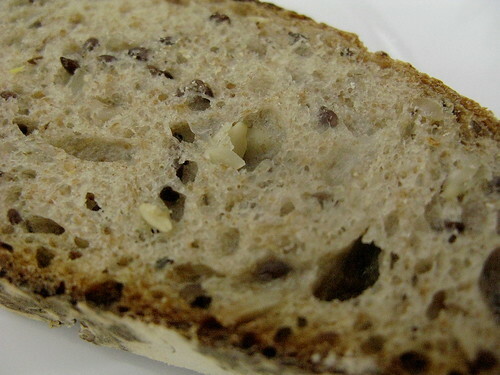 A “pure” bread that I like the most. 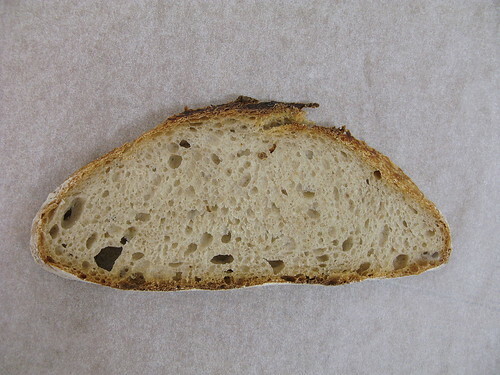 There is another Vermont Sourdough recipe in Hamelman’s book using 10% rye and 15% starter, and this one is increased to 15% and 20%. 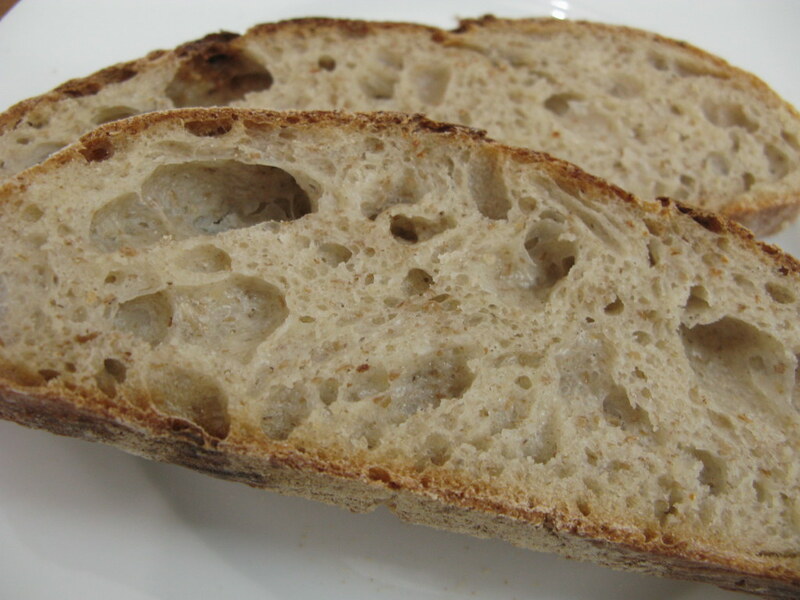 According to the book, the increased rye provides more fermentable sugar and minerals to the yeasts in the levain. 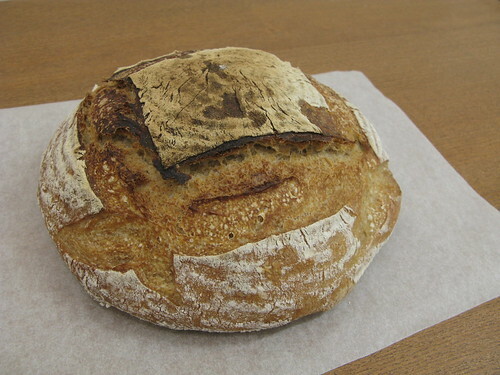 In addition to the increased levain, this bread is more acidic than the Vermont Sourdough. 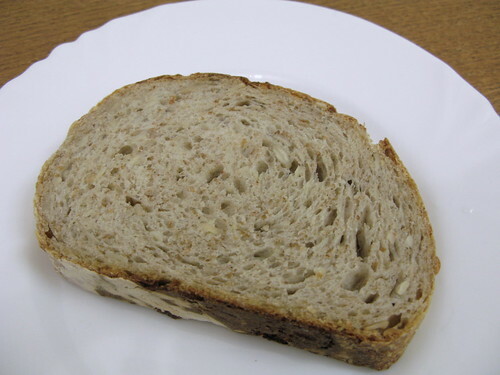 Since acidity has tightening effect on gluten structure, the crumb of this bread is tighter, chewier, and more elastic. In terms of taste, this version is sweeter and more tang to me. Definitely I prefer this one more. 1. Mix ingredients for liquid levain build. Cover & let stand for 12-16 hours at 70F. 2. When the levain is done, mix all ingredients except the salt of the final dough to medium consistency. Cover and let stand for autolyse for 20-60mins. 3. Sprinkle in salt and mix for another 1 1/2 -2 mins. 4. Bulk fermentation for 2 1/2 hrs. Fold after 1 1/4 hrs. 6. Bake at 460F for 40-45 mins with normal steam. I made Daniel Leader’s Sunflower Seed Levain today. It is a pain au levain (70% white flour, 24% whole wheat flour, 6% rye flour, 25% stiff levain, 60% hydration & 2% salt) with 14% sunflower seeds (soaked in 35% water overnight and then drained). The bread is too moist and sour for me. It also hasn’t got the taste of sunflower seeds. I wonder if it is because of my skills or the recipe. I’ll try some more sunflower seed recipes later to find out what’s wrong. 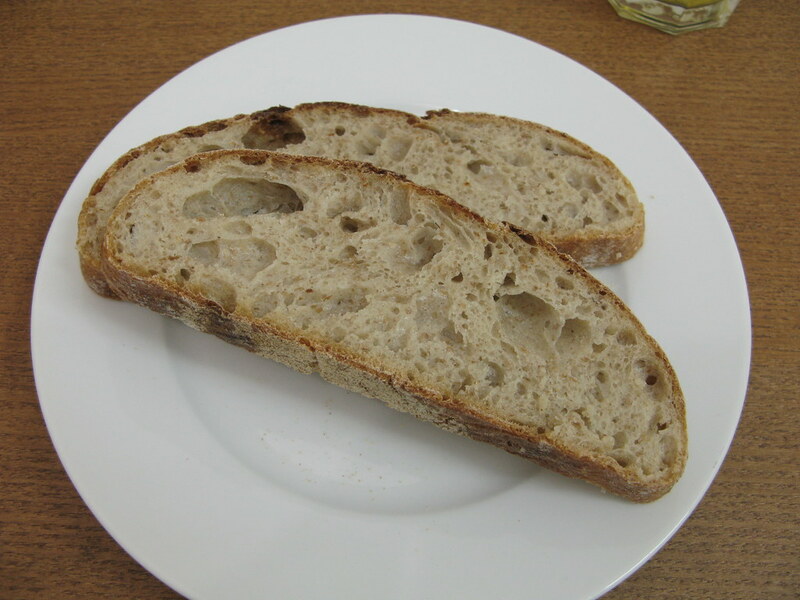 *** Today (the 2nd day) I ate the levain again. Surprisingly it was good and tasted different. 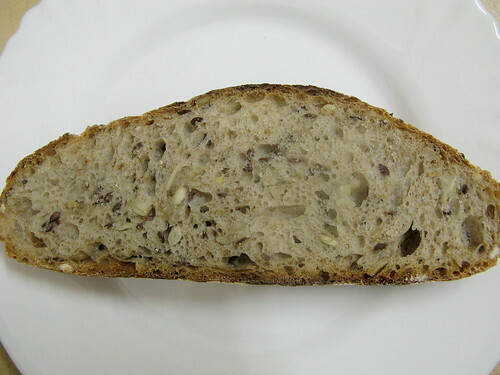 It’s less sour and moist and has a nice balance of the tang, wheat and seeds flavors. 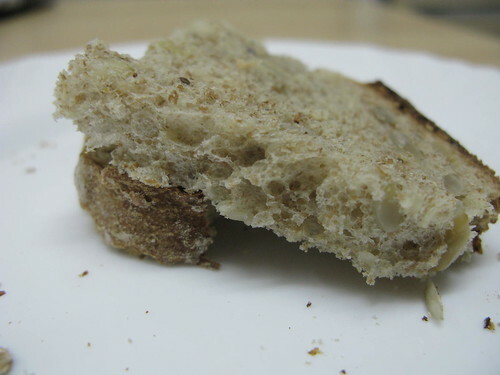 Now I think it may because the bread was still a bit warm when I ate it yesterday, which enhanced the sourness and moisture. How important “cool down completely” is. Now the bread is much better. I like it. On top of the bread were rolled spelt. Though they only had a slight spelt flavor eaten with the bread, they were crunchy and I love this. 🙂 The bread had a light spelt flavor and was quite tasty, but I prefer the rye version. 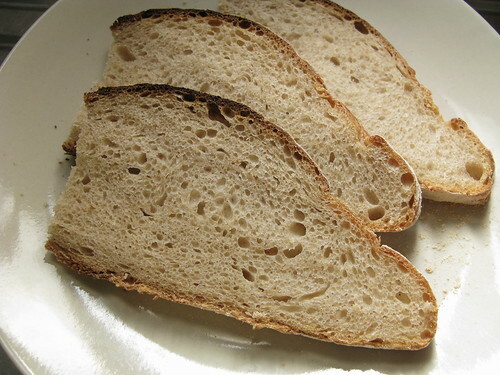 I like Peter Reinhart’s Whole Grain Bread book, as I always love the strong wheat flavor of whole wheat bread. And the recipes inside allow me to make in just 2 hrs. In this way I can make bread after work (relaxing activity after work!). 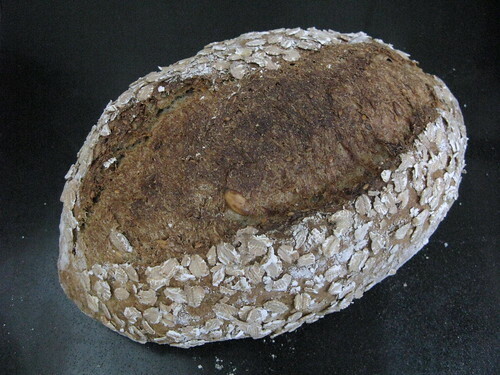 Even though this bread contains a high percentage of whole grains (35%), its crumb is not substantial but is very light and moist. I believe the key is the extremely high hydration (98%), of which 40% is to soak the grains thoroughly. I used rye meal instead of cracked ryes as I could not find them. 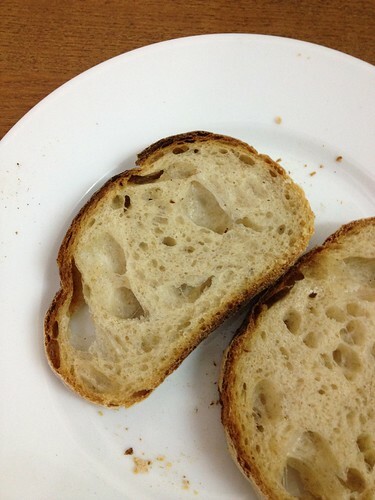 Luckily the crumb is still nice. 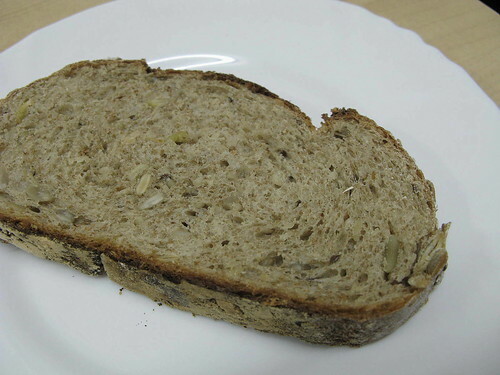 The bread first gives a taste of the mildly toasted sunflower seeds, then it comes the subtle rye meal and sourdough flavors. A good combination of grains. My new favourite.